First full cut on the prairie-pasture. The drainage has been a success and I was able to get the big John Deere out there earlier than ever before. Six eight-foot long two-by-twelves make up the two new planter beds. Two were sawn in half to do the four-foot ends. Quarter-inch hardware “cloth” screens the bottoms. Fastened together by impact wrench, using four-inch TimberLOK lag screws. The flat top plates are mostly decorative. They are both buried about five inches deep, and first I had to rake-up the black tanbark and then shovel-out all the dirt onto a tarp. It was a good couple days work, and boy are those things heavy! This is not pressure-treated so the expected life-span is not great. Plus it’s nailed, so temperature acts on it, expanding and contracting, it gets loose. At least the drip system is already in place. We’re back to a bit of off and on rain, but the high country is set to get another four to six feet of snow over the next couple days. We’re having a bit of clear weather, so I had to get busy. Yesterday I was out back behind the shed cleaning up a woodpile, while today it looked like a good day to run the mower and spread some more of the calcium-gypsum granulate – it’s supposed to soften up the hard-pan. Also rain is forecast for Wednesday and I want the material to water-in. But first some more woodpile work, then lunch. Since I was running the spreader (over the foreground, in picture) I decided to mix-in a bunch of “Weed and Feed” plus some grass seed. The soil is rocky and pock-marked with gopher holes, and it’s generally a mess of weeds, but it’s slowly improving if you don’t look at too close! On the other side of the bridge, to the right, a big bunny has taken up residence, and the machinery sound didn’t bother him a whit. It really a jack rabbit, and when he gets up to run, he’s nearly waist-tall without counting his long ears! Meanwhile it got up to 69-degrees this afternoon, lovely. 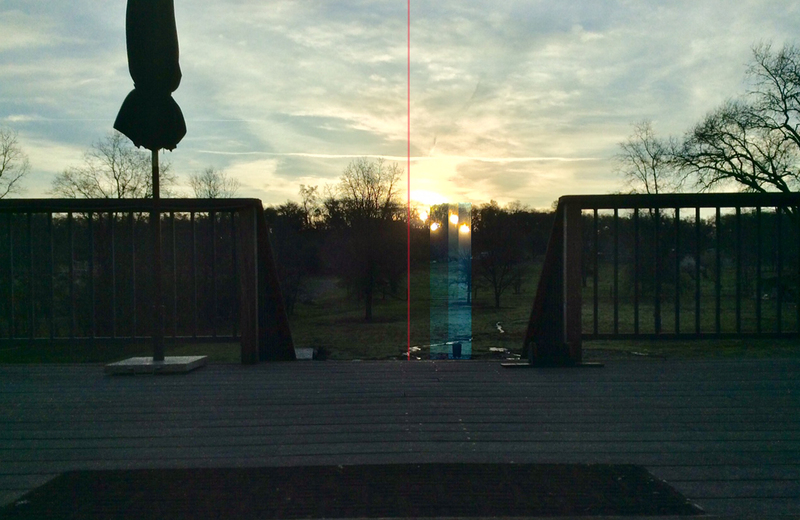 The sun slowly moves between the pillars. In a couple days it will be Ranchquinox. Or something. …makes the Daffodils look better. Still dang cold outside though. Kinda about the best thing that can be said for this week of atmospheric aquatica. Lots of snow up in the high country, they’ll be skiing on the 4th of July, again.